It’s a hot July afternoon in the Nahe, a wine region situated about 45 minutes southwest of Frankfurt, Germany. Named for the river that winds through the region, the Nahe river spans 125 kilometers (78 miles) from west to east and then north where it flows into the Rhine. With 4,200 hectares (~10,400 acres) under vine, the Nahe is one of the smaller wine regions in Germany but one of the most geologically diverse. 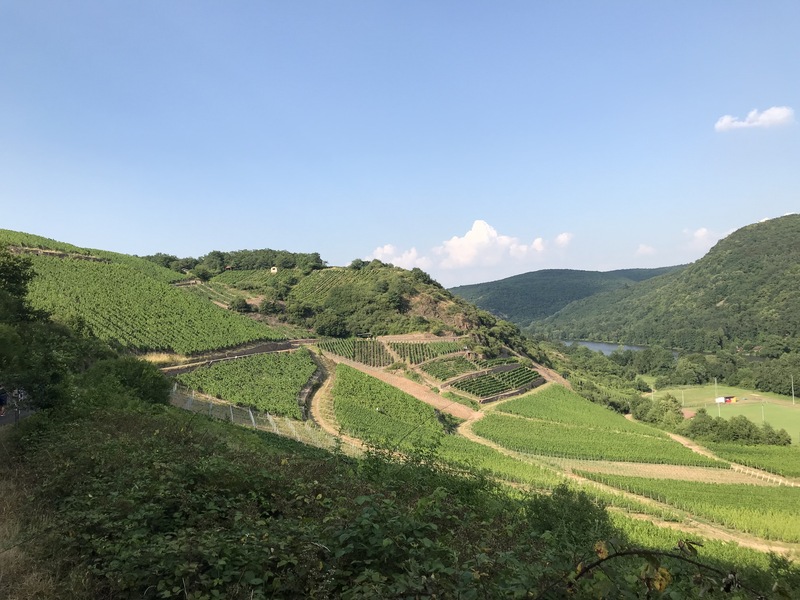 From argillaceous shale to bunter, conglomerate to quartz, phyllite to red sandstone, vines in the Nahe are growing in about 180 different soils. I’m descending a steep 40 degree slope in between rows of 65-year-old Riesling vines planted in the renowned Hermannshöhle vineyard before meeting Nahe wine pioneer, Helmut Dönnhoff, for dinner. Rising steeply from the banks of the Nahe River, the Hermannshöhle is widely considered the most renowned vineyard in the region and Dönnhoff one of the most celebrated winegrowers in the country. Mr. Dönnhoff — lean with thinning gray hair and youthful, bright eyes framed by wire-rimmed glasses, looks more like an ivy league professor than a wine icon — emerges from the back dining room to welcome us as we arrive at the restaurant. He offers a pour of his 2017 Tonschiefer, a delicate yet energetic and minerally Riesling. “This is the from the Leistenberg vineyard on the other side of the river, just south of here,” said Dönnhoff pointing in the direction through the front window of the restaurant. Riesling, history of the Nahe, and Mr. Dönnhoff’s evolution over nearly 50 vintages would be themes for dinner conversation. The Dönnhoff family came to the Nahe about 250 years ago, settling in the small village of Oberhäusen, situated in the central part of the region along the banks of the river. The family operated a traditional farm with livestock, vegetable and fruit gardens and some vineyards until the 1920s when Helmut’s grandfather, Hermann Dönnhoff, transitioned to cultivating vineyards. When Helmut took over the vineyard and cellar in 1971 (considered the best vintage in decades), he farmed four hectares of vines. Though the Nahe is a region steeped in tradition, much has changed in the 47 vintages since Donhoff took over. Dönnhoff conceded he worries about the future of Riesling if the climate continues to change and the region gets hotter. “Consumer perception of Riesling in other markets is another change we are benefiting from. Our German customers have long preferred dry Riesling but I think consumers in other markets are beginning to understand that not all Riesling is sweet,” said Dönnhoff with an optimistic sigh. With so much sweet Riesling crowding shelves in the U.S., American consumers may not yet understand the virtues of dry Riesling (maybe it’s those confusing labels!). The adage, consumers talk dry but drink sweet still holds in the U.S. Nearing 70, Mr. Dönnhoff acknowledged that he spends more and more time thinking about the next generation of the family business and legacy. 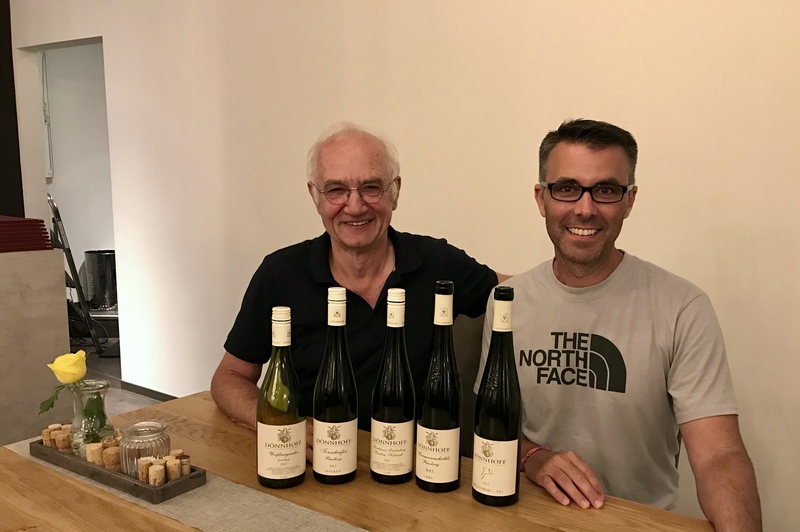 Dönnhoff’s son, Cornelius, joined him in the vineyard and cellar eleven vintages ago after completing viticulture studies and internships in other regions. Cornelius is among a growing number of talented young winemakers who grew up in the region, studied viticulture at prominent universities and apprenticed in other regions gathering experiences to bring back to the Nahe. As with any transition from one generation to the next, there will be changes and challenges. Soon after taking over the family winery nearly fifty years ago, Mr. Dönnhoff made the costly decision to remove all of the irrigation installed by his father in the 1950’s. Equally difficult decisions are on the horizon for the next generation of Dönnhoffs — adapting to continued changes in climate and evolving consumer demand while maintaining Dönnhoff’s world-class reputation among them. “Cornelius is focusing on working as close to nature as possible and making light, playful wines with no opulence in alcohol and sugar,” said Anne Dönnhoff, Cornelius’s wife. Mr. Dönnhoff is still involved in all phases of the vineyard and winery but, it’s only a matter of time before Cornelius puts his personal stamp on Dönnhoff wines in the same way Helmut did. Dönnhoff’s daughter, Christina, started studying winemaking but then switched to Architecture. “She’s now back to studying winemaking,” remarked Dönnhoff with a smile. Today, the Dönnhoff family farms 28 hectares of grand cru vineyards across nine sites and produce about 17,000 cases of wine. The majority of the vineyards are planted to riesling with some pinot blanc and pinot gris. Rieslings are aged in stainless steel tanks and wooden casks. Pinot Gris and Pinot Blanc are aged in new casks for five to six vintages before they are used for Riesling. Dönnhoff Rieslings are more elegant than opulent. Blends from multiple vineyards are elegant, light and minerally while the vineyard-designates like Niederhauser Hermannshöhle and Norheimer Kirschheck are etheral; some of the finest, ageable wines available. Prädikatswein, Trocken, Kabinett, Spätlese, Trockenbeerenauslese, VDP.GROSSE LAGE — understanding German wine labels can be confusing and intimidating. 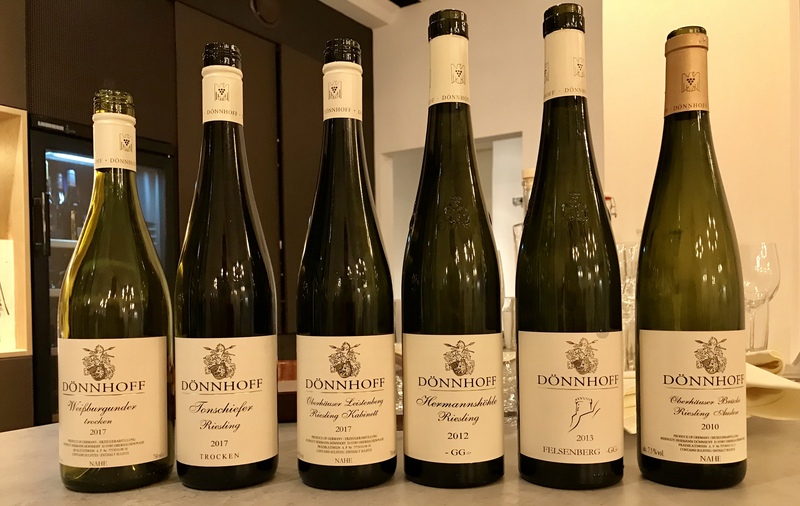 Wine consumers in search of world-class Riesling without having to decipher the confusing label puzzle should seek out Dönnhoff wines. Bottles bearing the Dönnhoff name are always elegant, expressive of place, and much higher quality than the price paid.